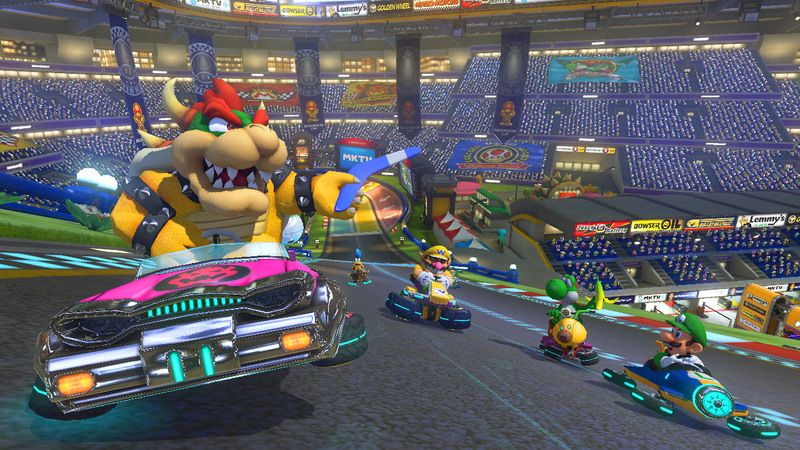 Mario Kart 8 is a game that almost needs no introduction. After eight installments over 20 years (not including Bandai Namco’s arcade spinoffs), the Mario Kart formula has become one of gaming’s most reliable series. It’s also practically review-proof. No matter what I write here, 1.2 million people have already taken the plunge, and the game will likely continue to sell. Fortunately for those people, it’s still pretty good. Just in case you’ve been living under a very large rock for the last 20 years, Mario Kart is a kart racing game starring the various members of the Super Mario Bros cast. As you race around each course, you’ll pick up various Mario–related items, which give you some assistance in finishing in first place, whether that be attacking the other racers or giving you a speed boost. It’s the formula that has defined the whole genre for the past two decades. But just selling the same game with prettier graphics doesn’t work long term, so Nintendo has tried to change up the formula over the years. This time, we get an anti-gravity mechanic. There’s really not much that it adds to the actual gameplay. 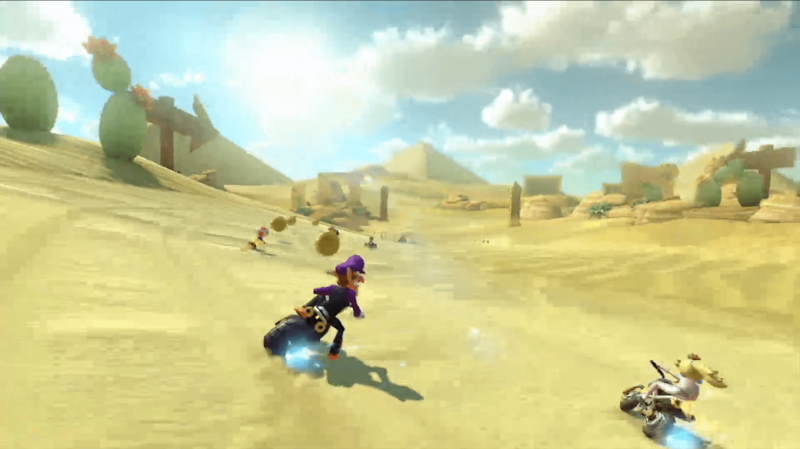 The only real difference is that when you hit another kart or an obstacle on the anti-gravity portion of the track, you get a speed boost. However, it does allow tracks to have much more interesting layouts than they did in previous games. Taking gravity out of the equation allows from some really interesting 3D worlds that couldn’t have been done otherwise. This isn’t F-Zero: Mario Kart. It’s distinctly its own thing, and it’s better for it. There are some tweaks to the gameplay besides the anti-gravity. 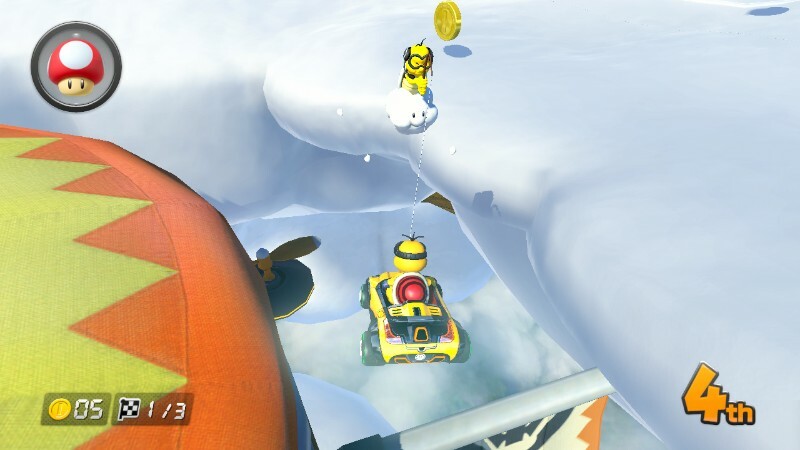 Lakitu (the little cloud guy that saves you from pits) is really on the ball here: as soon as you go over the edge of the track, he picks you up and puts you right back on track, minus three coins. As such, falling off the edge is no longer as fatal to your chances of winning as it used to be. Like Mario Kart 7, you can customize your kart with parts that have various attributes. Your racers fall into main three categories (with some variation in each): light, who have high acceleration, but low top speed; medium, who balance speed and acceleration; and heavy, who have a high top speed, but a low acceleration rate. These broad classes can be tweaked by choosing certain parts. Want more acceleration with a heavy character? That’s doable. Maybe you want a higher top speed with a light character? That’s possible, as well. Plus, there’s a certain joy in finding the set of parts that works best for you. It makes that kart feel unique to you. The retro tracks leave a little to be desired. The anti-gravity mechanic that gives the new stages all their uniqueness doesn’t translate well to the old style of track design. There are more than a few tracks that don’t use it at all, and the ones that do are often only superficially different. It also doesn’t help that a lot of the best remembered tracks from the classics have already been reused by other recent games in the franchise. That’s not to say they’re bad; they just aren’t that different from the last time you played them. There’s a roster of 30 characters this time around. 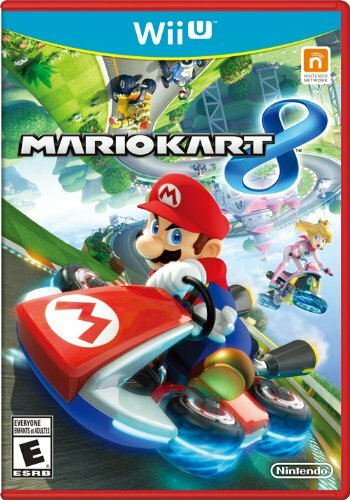 You get 16 by default, which features the expected Mario Kart cast, and there are 14 more to be unlocked. Unfortunately, the characters are unlocked randomly whenever you complete a new grand prix, so if you really want to play as a Mii, you may have to play 14 different cups before you unlock that option. New characters include the fan-favorite Koopalings who offer a new variety of all classes of characters. No matter what your preferred class, there’s a wide selection of choices for you. 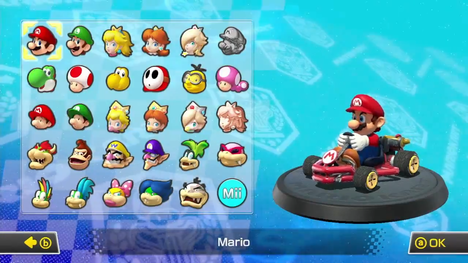 While the kart customization makes specific characters less important than they used to be, having most of the Mario cast there for your choosing is still a nice touch. If there’s one weak portion of the game, it’s the Battle Mode. Unlike previous games in the series, which used small, intimate battle grounds on which to unleash chaos, the Battle Mode just recycles tracks with Balloon Battle rules. It’s pretty disappointing, as, even with the max of twelve players, it’s hard to find your opponents. After all, these were designed as races, not battle grounds. Though, since my favorite battle mode isn’t included (Bob-omb Blast from Double Dash!! ), I’m not too upset about it. The online mode is solid. I played with a whole bunch of fellow staff members, and I didn’t experience any lag whatsoever. Starting the race takes a little longer than a local race, but it’s never more than ten seconds. Starting a game for friends is incredibly simple (with all the rules in the hands of the one who created the match), with voice chat in the lobby. There’s no voice chat during the race, unfortunately. Tournaments are also easy to set up, and all rules can be customized to your liking. You are given a numeric code for the tournament, so you can share it with friends. The only time you can’t customize the rules is in random matchmaking. There’s a simple system in place for random match making. You start out with 1000 points. As you win or lose races, points will be added or subtracted. You’ll hopefully only be placed in races with people who have similar scores as you. I’m not sure how well this will work in the long term, but at the moment, it seems to work fine. 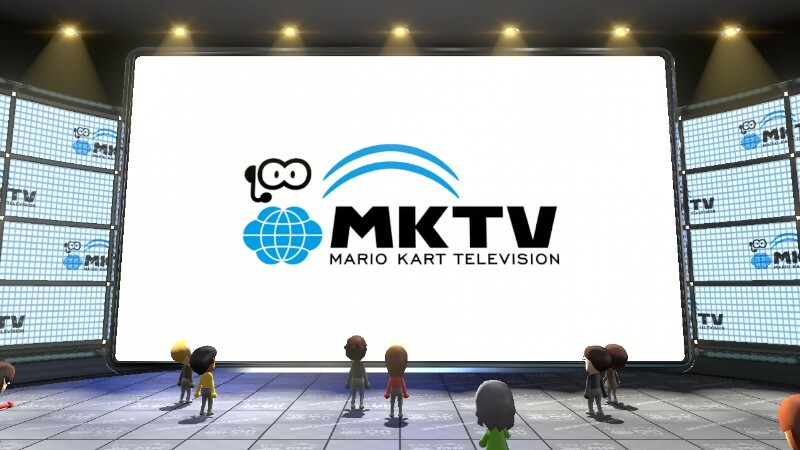 Mario Kart TV is a good idea, with problematic results. 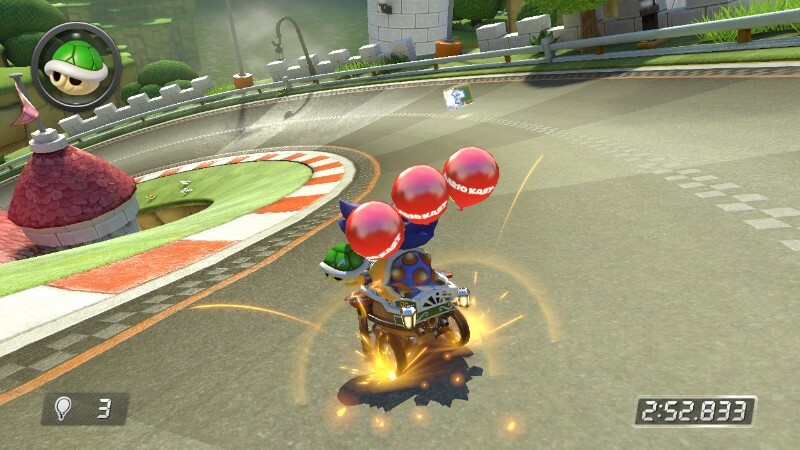 Mario Kart 8 keeps replay files for your last 12 matches, with the option to save six more indefinitely. With these, you can watch the whole race with dynamic camera angles. You can even upload up to 60 seconds of the race to YouTube. The problem is that the system is limited by a lack of controls, as they are designed to work with a button-deprived Wii Remote. There are no camera options, so if you’re really proud of that first time you used a Boombox to take out a Blue Spiny Shell, but the camera is at the wrong angle to see it, you are out of luck. You also can’t record any parts of the race you want to share; you are limited by the highlight options, which may not pick up the parts you actually want. I’m convinced that these limitations are the result of making the feature Wii Remote compatible. The system is almost ready for editing. Camera controls are already dynamic, so it should be no problem to attach them to a control stick. All that would be needed is the ability to capture the parts of the race that you wanted. And this isn’t the Wii; Nintendo can count on every player having a GamePad. Just say that Mario Kart TV is only compatible with the GamePad, and have at it, Nintendo. The presentation is nearly flawless (the only flaw being Donkey Kong’s fur texture). The game looks amazing on an HD TV. All the colors really pop. And the music steals the show. Mario Kart Wii‘s Moo Moo Meadows may have had the best theme in that game, and to hear it rearranged with musical instruments, is absolutely amazing! Orchestration has really added a lot to Mario Kart’s music. So, do I recommend it? Yeah, if you have a Wii U, this is a must-play game. If you’re a fan of Mario Kart, this is a must-play game. Kart racer fans, same deal. For everyone else? Are you getting a Wii U anyway? Maybe I’m jaded, but this doesn’t scream system seller to me. System justifier, certainly. It’s a really good time, especially with friends (as if that needed to be said). Go buy it if you have a Wii U, or when you get one.